You can now buy the Samsung Portable SSD T1 in Singapore, which is the fastest external hard drive you can find. Stylish and portable, it represents a shift towards better quality media for your portable storage. No more waiting around for files to be copied. A stylish external portable Solid State Drive (SSD), it represents a new standard of storage for today’s digital life. This makes the Samsung Portable SSD T1 ideal for business travellers, creative professionals and content creators, such as photographers and videographers, with a need for secure local storage they can take on-the-go and use to quickly transfer large amounts of data. Powered by Samsung’s proprietary 3D Vertical NAND (V-NAND) technology, the Portable SSD T1 was first announced this year at CES 2015. The Samsung Portable SSD T1 is a combination of powerful performance and a well-designed shell roughly the size of a business card. The Samsung Portable SSD T1 is available now in 250GB, 500GB and 1TB storage sizes, at an RRP of $299, $459 and $899 respectively at major consumer electronics stores, authorised retailers and Samsung Experience Stores. Each unit of the Samsung Portable SSD T1 comes with a three-year limited warranty. However, with SSD prices falling, DIY fans might want to consider duplicating functionality at almost half the cost with a 2.5″ SSD and a USB 3.0 case. Build for speed – With Samsung’s innovative TurboWrite technology topped with a USB 3.0 high-speed interface, the Portable SSD T1 has a data transfer speed 3 to 7 times faster than an external HDD depending on file size. In a User scenario test (transferring 500 photos of 10mb each), the T1 (500 GB) took just 10 sec. While on a typical External HDD (500 GB), the same transfer required 65 sec. Secure and Durable Local Storage – The Samsung Portable SSD T1 is easy to set up and protect, so professionals can be assured that their original work will be safeguarded against unauthorised access. With no moving parts, the Samsung Portable SSD T1 is also designed to withstand more shock impact3 and more vibrations than alternative storage solutions with sensitive moving components. 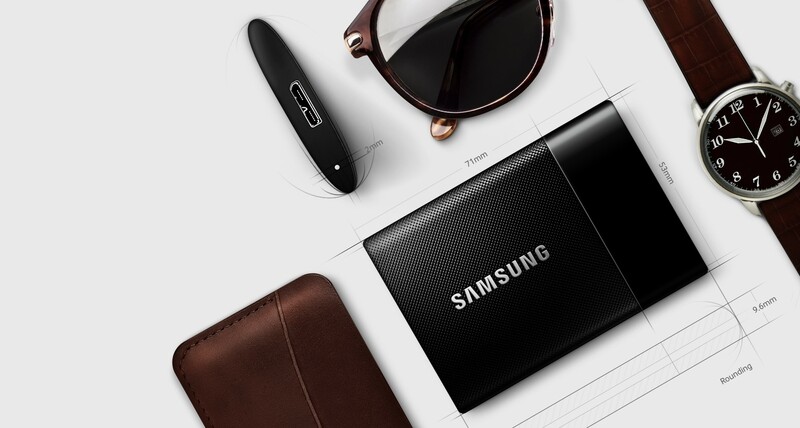 Stylishly Designed for Maximum Portability – Featuring an ultra-sleek finish that has a laser-patterned, textured surface punctuated by black chrome metallic accents, the Samsung Portable SSD T1 has a compact design that weighs only 30 grams, ensuring maximum portability.